Doctor said I needed to get compression socks so thought I would give these a try. Great price compared to other locations. Need to wear them due to medical issues - can't wait to receive them. I needed more compression hose. I must wear compression hose to for my circulation and to improve my mobility. I gave over seven pair away to sisters. Needed more for myself! I stand on my feet all day at my job. To help with my swollen ankles. I always wear compression knee-highs on airplanes to help with circulation and to help keep my ankles from swelling. Increase circulation and relieve swelling for all-day comfort and support. Have ordered these in the past and they are very supportive and last a long time. I believe they will provide the same results as the other $30 plus hose. Hopefully will assist my ability to be on my feet for awhile. I especially like to wear these because they are so thin and really "stay put" on the legs. Swelling of feet and ankles is one of my physical issues. These socks should help. Ordered these socks for my mother. I've noticed that some of the socks she wears cause her ankles to swell slightly because the band at the top cuts circulation. health reasons dictate I wear a support hose. I hope these work for me. I wear compression hose daily so want to try these because of the reasonable price. I purchased this item previously and they work really well for me. have swollen ankles and need the compression. Wish you had more colors! these are great for my legs! 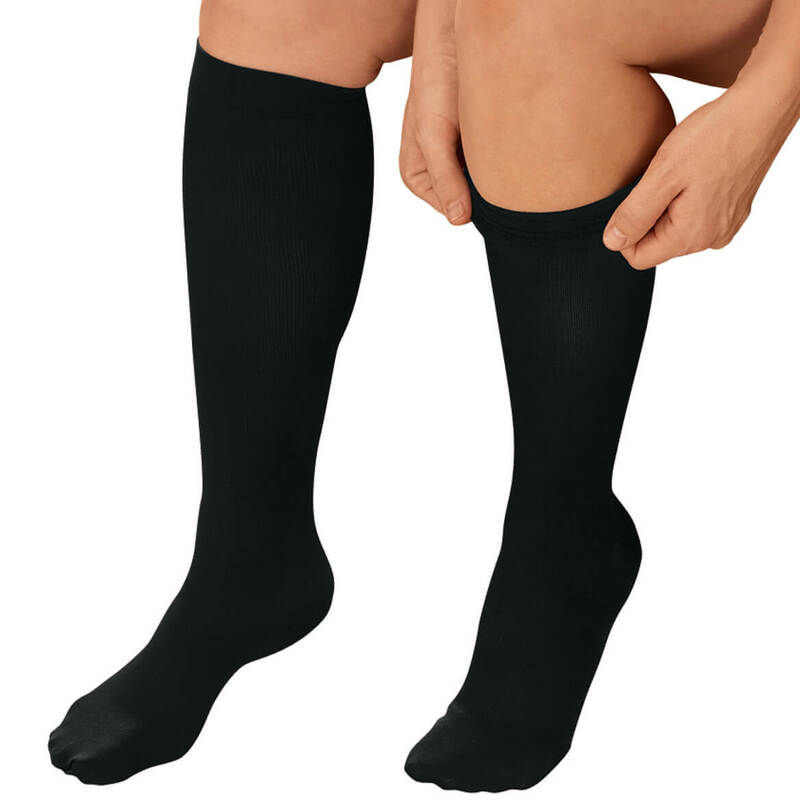 I needed support socks to keep my legs from swelling and it helps them to not be tired all day. Are we to order by shoe size or calf measurement? BEST ANSWER: Thank you for your question. You should order by your shoe size. We hope this information will be of help to you. BEST ANSWER: Thank you for your question. There are color choices in the drop down box provided. These come in black, white and navy.We hope this information will be of help to you. Yes they come in white good enough for inspection. They also come in several other colors and patterns. I am currently wearing a pair and feel the support. Yes there are. They come in black, blue, and white.. They give great support to your legs. Can someone please tell me numerically (in numbers), what is considered a small, medium, and large? Thanks! BEST ANSWER: Thank you for your question. Medium is 5 1/2-7 1/2, Large is 8- 10 1/2, and XL is 11-13. We hope this information will be of help to you. What are the sizes in numbers medium, large, xl large? BEST ANSWER: Thank you for your question. The sizes are Medium (5 1/2-7 1/2), Large (8-10 1/2), XL (11-13). We hope this information will be of help to you. what is the width of calf for each size? BEST ANSWER: Thank you for your question. These have a 12-14” calf size. We hope this information will be of help to you. when I order they do come in a pair? BEST ANSWER: Thank you for your question. Yes the compression socks do come in a pair. We hope this information will be of help to you.